It was once licensed by and is now entirely developed by NewTek. 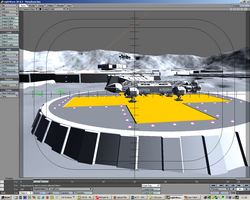 Lightwave has long been known for its excellent rendering abilities and unusual user interface (for example, icons are not used; instead functions are all given descriptive titles). Like many other 3D packages Lightwave is composed of two parts, an object modelling environment where 3d models or meshes are created and an animation environment where models are arranged and animated for render. Unlike most other packages these two parts are stand-alone programs. There is also a separate rendering application which can be run on multiple machines. Some functions within LightWave are multi-threaded which means those components can use as many as eight processors in the same machine at the same time when rendering an image. Programmers can expand LightWave's capabilities using an included SDK and also a special scripting language called LScript. This SDK is based in the powerful C language and almost anything can be created, from a custom shader to a different scene format exporter. LightWave itself includes dozens of free plugins and many more can be obtained from different developers around the globe. In 1988, Allen Hastings created a rendering and animation program called Videoscape, and his friend Stuart Ferguson created a complimentary 3D modeling program called Aegis Modeler. It is these two programs that would evolve into what would eventually be known as Lightwave 3D. Newtek planned to incorporate Videoscape and Aegis into its video editing suite, Video Toaster. According to Hastings, Newtek originally intended to call the new 3D program 'NewTek 3D Animation System for the Amiga'. Later, in December 1989, Hastings came up with the name 'LightWave 3D', inspired by two of the high-end 3D packages of that time: Intelligent Light and Wavefront. In 1990, the Video Toaster suite was released, incorporating Lightwave 3D, and running on the Commodore Amiga computer. 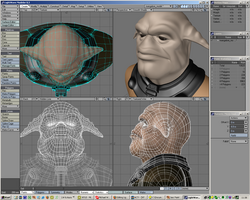 Lightwave 3D has been available as a standalone application since 1994 and version 3.5 and now runs on Mac OS X and Windows-based PC computers. LightWave gained fame as the program used to create special effects for the Babylon 5 and seaQuest DSV science fiction television series; the program was also utilized in the production of the recent Sin City and Star Wars movies. In 2001, a rift developed between NewTek management and a group headed by Vice President of 3D Development Brad Peebler, which included original developers Allen Hastings and Stuart Ferguson. For the second time in its history NewTek faced a major walkout, this time with most of its key Lightwave engineers and programmers leaving the company. After months of public confusion, the breakaway group formed a new company, Luxology. They have since shipped their own 3D package, modo. NewTek and LightWave have been honored with Emmy Awards since 1993 and won their 10th and 11th awards in 2004. In 2003 NewTek was awarded an Emmy for technology that has had a major impact on television. Now in its eighth version, its market ranges from hobbyists (because of its low price point) to high-end deployment in video games, television and cinema. The company recently shipped its 64-bit version of LightWave 3D (part of the fifth free update of LightWave 3D 8), and was featured heavily in a keynote speech by Bill Gates at WinHEC 2005. LightWave 3D 9 is expected in the coming months.